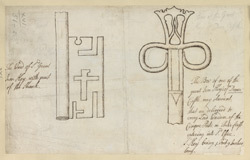 The fifth Viscount Torrington, John Byng, notes in an account of his 1790 tour of Dover that the chief public curiosity of the castle were these keys. Also on display was Queen Elizabeth's pocket pistol. Visitors were also encouraged to fling stones in the castle well, an activity that travel-writer Celia Fiennes indulged in during her visit to the castle in 1697.